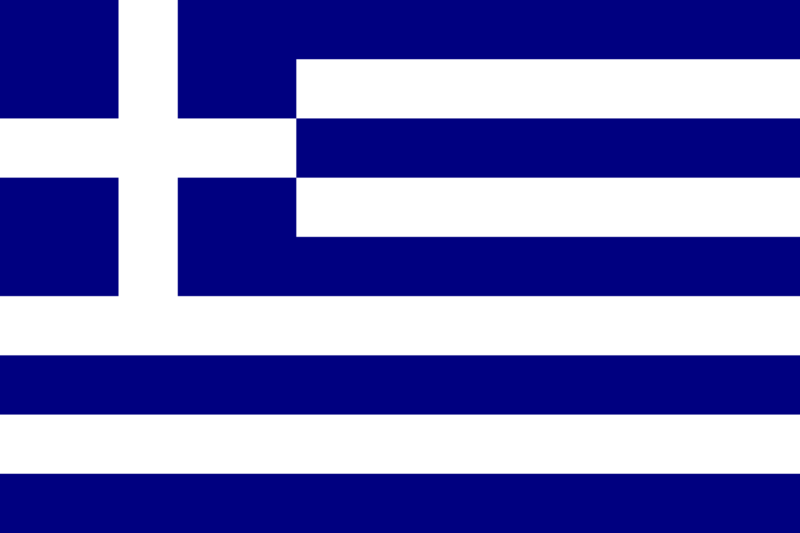 Want to catch island fever, soak up the sun & experience a few of Greece's hottest destinations? Now's your chance! 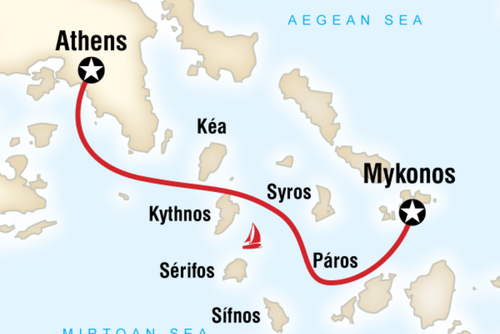 Starting in the Greek capital we'll then set sail to some of the country's best island spots. With 9 days, there’s loads of time to experience everything. Chill beachside, live it up with the locals, sightsee, indulge in awesome optionals or just relax. Finish back in Athens for another slice of the ancient city. It's a great way to combine culture, partying & seeing this beautiful area of the world. 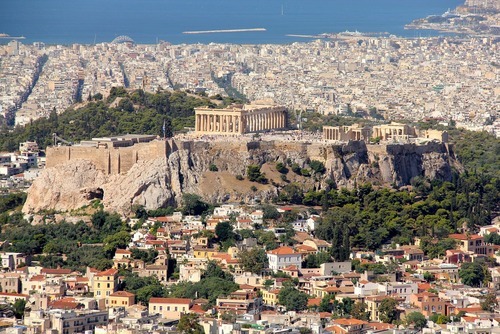 On arrival in Athens, check in to your hotel & take some time to explore this open-air museum. 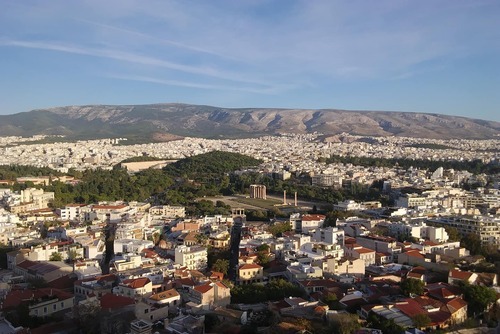 You could honour the birthplace of drama by climbing around the massive Theatre of Dionysus or get the background on Ancient Greece at the National Archaeological Museum. Otherwise, experience Athens’ urban heart, take off into the streets and find a hole-in-the-wall food joint, where you can try the famous souvlaki. This evening meet up with your Tour Manager & fellow Contiki travellers then wrap up the day on the shady slopes beneath the Acropolis and jump start your trip with an optional dinner in the rustic district of Plaka, where traditional tavernas spill out onto the pavements. Tonight’s festive atmosphere is perfect for toasting the start of the tour. Hop on board a ferry in the morning & head to the ultra chilled island of Paros, with its traditional Greek vibes, cool beaches & cute fishing villages. Hit the beach, shop or wander around Parikia & the old Venetian fortress. Later, hit up Parikia by night! Spend the day relaxing on island time. 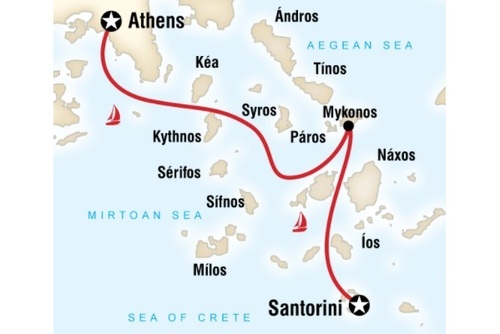 There’s the option of a cruise on a typical Greek boat, a Caique, to some of the gorgeous nearby islands & beaches for a spot of swimming & relaxing away from the town. There are loads of other options here too, you could also go exploring on Antiparos island or simply chill on one of Paros’ three main beaches as you relax & soak up the rays. There’s also plenty of shops to keep the keenest of shoppers entertained, or pick up some cute souvenirs to take home. We give you the chance to head to Naoussa with your Trip Manager who’ll give you the run down on this cute town. This spot is one of the most charismatic villages in the Cyclades. Built like an amphitheatre around a tiny picturesque port where colourful fishing boats are moored, the town is located in close proximity to the remains of a Venetian castle, which you’ll learn about here. In the evening is the best time to explore, it’s perfect for capturing some snaps to take home. There’s plenty of places to eat, so head to a local restaurant for a tasty meal, or if you’re up for another night out ask your Trip Manager for some tips on where to head to experience how the people of Paros party by night. Today: change islands and it’s a total change of scene. Santorini will make your jaw drop with its stunning natural beauty – the result of a massive volcanic eruption. From the water, look up at the iconic blue–domed, whitewashed churches. Once we’re back on land, take in the fantastic views of the neighbouring volcanic islands. Wake up to another day in iconic Santorini. Take advantage of our return transfers to the famous Perissa Beach. Considered a must-visit, this spot is famous for its unusual black sand, the result of the island’s volcanic landscape & sheltered environment. With its crystal blue water, it’s the perfect way to relax, swim & chill. The area is dotted with little tavernas & beach bars so taking a break from the beach here is a must. 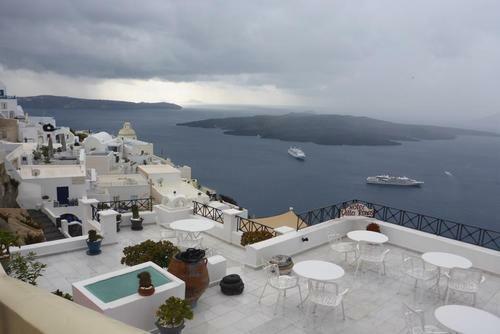 For those that love to explore you could hitch a ride on a donkey or take a cable car up to the cliff-top town of Fira, or visit Oia to see the island’s submerged volcano. After free time this morning, we cruise on to Ios. Relax on the boat and hang out with the group. Peaceful by day, pumping by night, Ios is the ultimate party destination. Relax on sandy beaches or lounge about poolside before a big night out, when Ios’ villages come alive. Head to the small streets of Hora, packed with clubs, bars and pubs and let loose to the pumping tunes. Otherwise, join the outdoor party in the squares and lanes. If you’re keen, you can keep it moving until dawn! 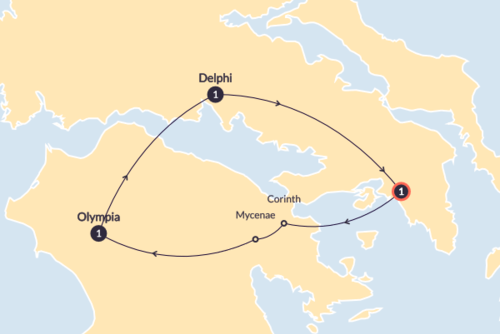 Wave goodbye to Ios and the Cycladic Islands as we set sail back to mainland Greece and spend a final evening together in the mythological city of Athens. The tour ends after check-out & it's time to say farewell to your new travel buddies. 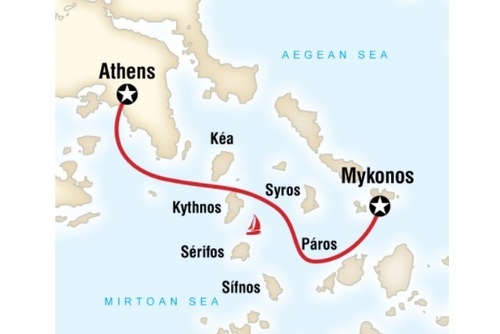 Or, choose to learn more about the birthplace of democracy with an optional sightseeing tour of Athens. Get the run down on the Parthenon, the Acropolis and the first modern Olympic Stadium with our expert Local Guide.